In this episode, I interview Joel Comm. Joel co-hosts The Bad Crypto Podcast and is the author of 15 books. His latest book is The Fun Formula: How Curiosity, Risk-Taking, and Serendipity Can Revolutionize How You Work. Joel shares how he learned the importance of living life on his terms. 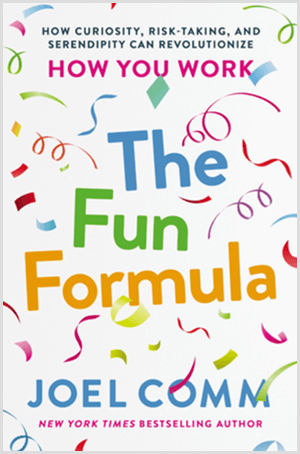 You’ll discover how the Fun Formula can improve your life. 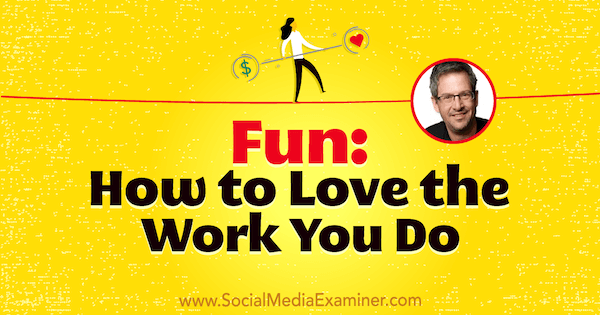 Fun: How to Love the Work You Do featuring insights from Joel Comm on the Social Media Marketing Podcast. On social media, businesspeople are bombarded with the message that they need to hustle and grind to succeed. If you want to get to the top, if you want to beat your competition, you need to hustle and grind every day. Get up and into the office before your competition, and work while your friends barbecue on the weekends. Joel thinks this philosophy is incredibly damaging and counterproductive to a successful business and a fulfilling life. For Joel, hustling or grinding caused him to spin his wheels more than anything else. It hurt him and his relationships. That’s why Joel sees this mindset as potentially dangerous. 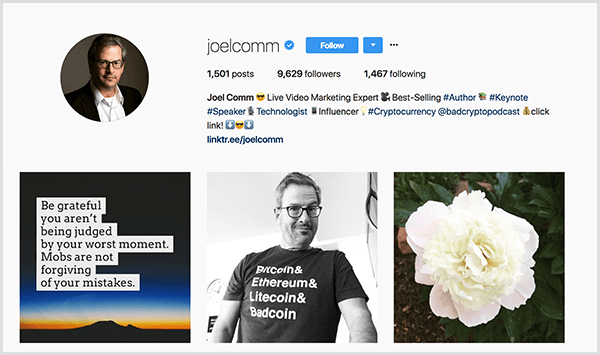 During his 23 years of doing business online, Joel has succeeded not because he worked incredibly long hours, but because he was curious, explored something he was passionate about, took a risk and was willing to fail, and allowed things to unfold in a natural manner. Essentially, he succeeded when he was having the most fun. Joel thinks the hustle and grind mentality goes back to his parents’ generation. They believed hard work is a virtue, and so does Joel. At times, you do need to buckle down and do the work. But the hustle and grind mentality is unsustainable as a lifestyle. Just because working hard sometimes is a good thing doesn’t mean working hard all the time is even better. Listen to the show to hear my thoughts on balancing work and fun. Social media encourages people to share only the positive things in their lives, not the real difficulties or struggles that they’re having. People want to seem popular with lots of friends and also highly successful. Some people focus on promoting themselves and sharing only what’s good. Others lie about who they really are and what they’re going through. Another issue is relying on social feedback (such as likes, comments, shares, follows, and retweets) for one’s self-esteem or sense of self-worth. This social feedback pumps people up. However, social media wasn’t intended to be a place where people’s lives seem perfect or are validated with likes, comments, and shares. Joel thinks these issues put the focus in the wrong place. Rather, Joel has the most respect for people who are authentic on social media by sharing the good, the bad, and the ugly. They’re the people he’s most likely to trust and buy from. In addition to authenticity, I mention the fear of missing out. Because I’ve been working hard on some projects, I’m not active on Instagram or doing anything with stories on Facebook, Instagram, or Snapchat. Although I enjoy watching my colleagues share stories about their lives, I also wonder if I’m doing something wrong because I’m not sharing stories. I ask for Joel’s thoughts on this fear. Joel responds by describing how his activity on Snapchat has changed. Before marketers became active on Snapchat, Joel was making original, creative, engaging content. His Snapchat following grew quickly, and he began telling his peers about the platform. The effort Joel was putting into Snapchat didn’t feel like work. But eventually, Snapchat stopped being fun, and Joel stopped using it. In fact, Joel believes the moment you feel like you should be doing something because you fear missing out (not because you want to do it), that fear is an indicator that you probably don’t need to do that thing. Focus on doing what comes naturally to you. With so many platforms, you can’t be everywhere. Joel then shares an experience similar to mine. When he sees our peers crushing it on Instagram, he momentarily wonders whether he should do more with his Instagram. But then he thinks, “You know what? I don’t want to.” When he’s doing the things he wants to do, he can be highly effective. However, if Joel forces himself to do something because others tell him it’s important, he probably won’t bring much enthusiasm to the work. He’ll feel like something other than his passion is driving him, which is a recipe for hustle and grind. Ultimately, that approach won’t get you what you want. A key component of the Fun Formula is listening to your own heart, soul, and passions. For example, although Joel wrote three editions of Twitter Power, he doesn’t often tweet live. He buffers content for his more than 900,000 Twitter followers, but he doesn’t engage much on Twitter because he doesn’t enjoy it anymore. His profile asks people to contact him via email, not direct messages. Instead, Joel is much more engaged on Facebook. He also does a little bit on Instagram. However, you’ll never see him on Pinterest, and he doesn’t really use Snapchat anymore. On rare occasions, he’ll do an Instagram story. By focusing on what he enjoys, Joel has a better quality of business and personal life. Listen to the show to hear more of my thoughts on the fear of missing out. Unfortunately, too many people are always selling or presenting their business in the way the characters in the movie Glengarry Glen Ross talk about “always be closing.” Joel tunes out social media accounts that do this within 5 seconds. Automated communication also doesn’t help authenticity. For instance, after Joel follows someone on Instagram, he sometimes receives automated replies about the account’s business. Joel suggests avoiding any kind of automation that sends a direct message as your first interaction with a follower. Joel won’t even use Messenger bots for that first interaction. Instead, focus on building a relationship. Telling authentic stories offers great opportunities to connect in ways you wouldn’t expect. To illustrate, Joel once tweeted the question, “What’s your favorite donut?” and said his was chocolate. The response to that silly tweet about donuts helped Joel realize that people are looking for ways to relate to one another. A simple donut offers a way to connect in a broader sense. Live video is an easy method to share in an authentic way. Joel loves going live and unrehearsed. He doesn’t script his videos beyond choosing a topic. Or if he’s a guest, he might open a couple of screens to show the audience. Otherwise, Joel is himself on live video. He might stumble over his words or forget what he is saying. He’s real, and people can relate to real people. You can be yourself no matter what your medium is. Whether you read one of Joel’s books, see him speak on stage, hear him on a podcast, read his blog, or meet him face to face, he’s the same person. He doesn’t pretend to be anything that he’s not. What you see is what you get. People try too hard to keep up appearances, and it’s just not necessary. Nobody knows this better than Candace Payne, also known as Chewbacca Mom. 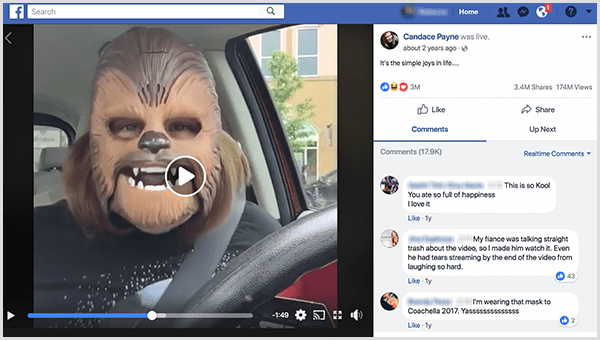 She was so excited about a Chewbacca mask that she fired up Facebook Live in her SUV and went live for four minutes. She didn’t prepare a script or take time to perfect her hair, makeup, and set. Yet her video was one of the most viral live videos of all time. Joel also keeps his video setup simple. He goes live from his home office. People who like, know, and trust you want to hear what you’re going to say. They want to know the value you bring. They’re not concerned about the presentation. Joel learned that he values keeping things simple and being himself through improv comedy. A few years ago, Joel took a sabbatical from his business and took improv classes. At the end of his workshops, the class performed for friends and family. Joel struggled because he has a hard time imagining himself in situations he hasn’t experienced, and improv involves a lot of that. After 8 weeks of improv classes, Joel realized that type of comedy is probably not best for him. He’s funny in spontaneous moments, but he doesn’t know when a funny moment is coming. It’s organic. It’s authentic. It’s in the moment. The only role he does well is being himself. Although the advice to just be yourself can sound trite, it’s truly helpful if you take it sincerely. If you’re not seeing the results you want in your business or you’re not finding satisfaction in life, ask yourself whether you’re faking it or doing something because someone says you should. Conversely, ask whether you’re doing what your heart tells you to do and follow your passions. Think about what you want to be doing but that feels scary to do. When fear is holding you back, it’s probably a really great indicator that you should be moving toward doing that thing. I then ask how we can be transparent without going over the edge. Joel says transparency doesn’t mean sharing a situation that amounts to airing your dirty laundry on social media. You don’t want to share things from your intimate circle of trust, such as a personal or business relationship, with the whole world. These situations should be managed privately between the concerned parties. Think about what you’re trying to accomplish by sharing your issues with a spouse, child, or business partner on social media. You don’t want to invite opinions from people who don’t know the whole story or don’t have the authority to speak about your life. If you’re looking for sympathy or wanting people to take your side, your private circle or an attorney may be more appropriate outlets. Listen to the show to hear my stories about authentic moments in my live videos. Around 2011, Joel went on a semi-sabbatical while he was going through a difficult time. The economy wasn’t good, and his business had taken a bad turn. Over the period of a year, he had to let go of everyone on his staff, which had peaked at about 35 people. The wheels fell off his 23-year marriage, and what started as a separation turned into divorce. Joel decided to take time to work on himself, and during this time, he wasn’t writing books or taking speaking gigs. He posted to his blog and social media a little, but mostly he pulled into a cocoon. He lost 55 pounds, dealt with baggage from the past with a counselor and his friends, and reconnected with God in a way that felt meaningful to him. After that sabbatical, Joel started speaking and writing books again. He also got into live video. From the outside, Joel seemed to be back on top of his game. 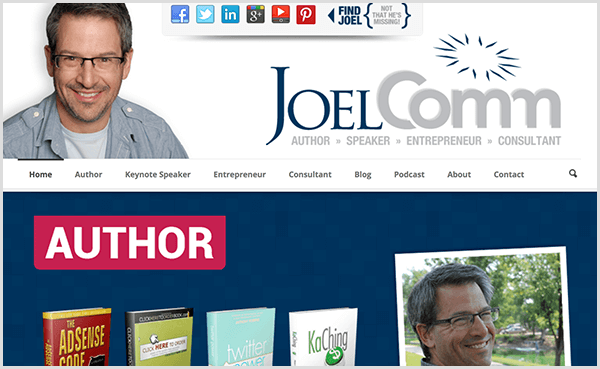 However, Joel was missing a unicorn like he’d had in the past, like selling a site to Yahoo!, creating a bestselling iPhone app, or appearing on The New York Times bestseller list. Although Joel was succeeding, he felt like he was coasting. Meanwhile, he was writing The Fun Formula, and part of the formula is trusting the process. 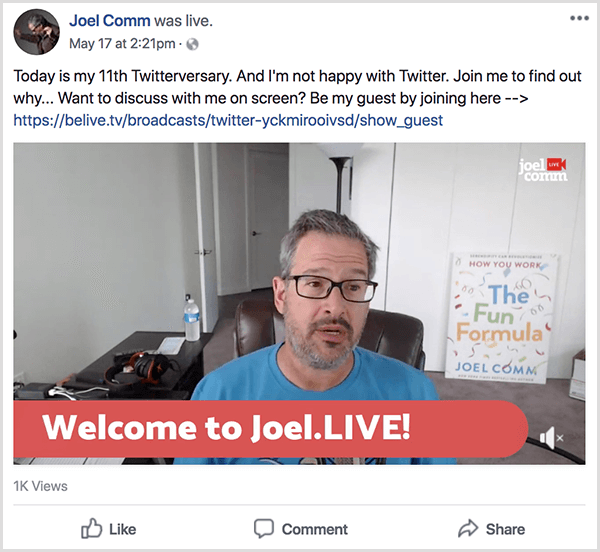 The formula is based on what Joel has learned from his huge successes: he had to allow time for things to fall into place with the right phone call, email, idea, timing, and execution. That’s where the magic has always happened for him. However, as Joel was writing a book that taught people to allow time for things to fall into place, he was having doubts. He was wondering if his best work was behind him. When he realized what he was doing, he began to follow his own advice and practice what he was preaching. Around April 2017, while he was waiting for edits on the first draft of his book, he started exploring cryptocurrency. Bitcoin, blockchain, and the whole cryptocurrency world piqued his natural curiosity, and he became fascinated in the same way as he had been with live video and creating websites. Almost daily, Joel was chatting on Messenger with friend and leading marketing technologist Travis Wright about different cryptocurrencies and related news. On July 16, 2017, Travis asked Joel, “When are we going to start the Joel and Travis crypto show?” Travis put a little winking face next to his question like he was being sarcastic. However, Joel called Travis right away because he knew they had to create this show. It sounded like fun, and Joel wanted to take a chance on it. Joel thought they could create something that nobody else had. 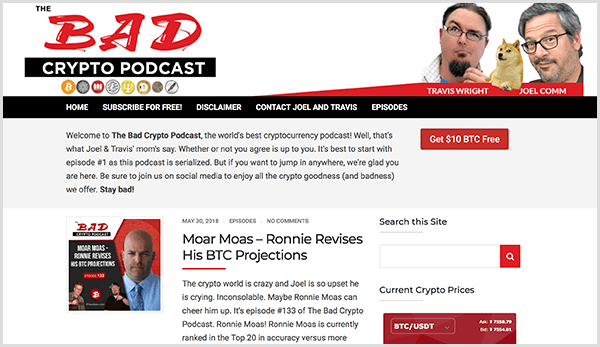 Two days later, they released the first episode of The Bad Crypto Podcast on iTunes, had designed a website, and put together their social media. On the day this interview was recorded, The Bad Crypto Podcast was ranked 49th in the business podcast category. It’s been as high as number 25 and has been downloaded more than 4 million times. It’s a unicorn. Joel didn’t see this success coming, and Travis and he couldn’t have planned for it. However, the process and the Fun Formula worked once again. Joel’s glad he struggled with his own doubts while writing the book because that experience forced him to live what he’s teaching. I ask what Joel would say to someone who’s wondering whether their best is behind them. Joel says that if you have a pulse, you have opportunity right now. Everything that you’ve done and experienced in your life — the good, the bad, and the ugly — has built your knowledge and wisdom. The totality of your experience makes the value you bring to your next thing even greater. As an example, before his current podcast, Joel had done radio and podcasting, built websites, and crafted messages and programming. All those experiences helped get him ready to produce The Bad Crypto Podcast. Listen to the show to learn about the podcasts Joel created before The Bad Crypto Podcast. Joel talks about failure extensively in the book because failure is an inevitable part of life and business. Whether or not you’re authentic, you’re going to fail sometimes. But those who are authentic aren’t afraid to embrace failure. In fact, Joel’s failures have been some of the greatest teachers in his life. 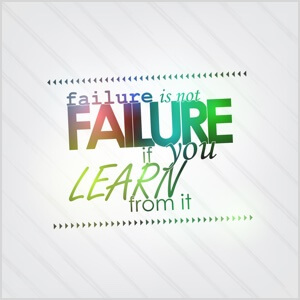 He’s learned more from failure than from the things that worked out. Joel takes a lot of inspiration from Babe Ruth, who held Major League Baseball’s home run record. When he came up to bat, he swung with everything he had and struck out more times than he hit a home run. Like Babe Ruth, you have to swing if you’re going to hit the ball out of the park. Joel says he’s swung a lot of times. People like to talk about his New York Times bestsellers, and other accomplishments and awards. However, Joel loves to parade his failures, such as the dozens of websites that never went anywhere, and information products and books that didn’t sell. In 2009, Joel founded a mobile messaging startup. After investing six figures into that business, it failed epically. From that failure, Joel learned it’s tempting to hold onto something that’s failing instead of letting it go. Joel thought that closing the messaging service would feel like the biggest failure. But after he let the service go, even though he couldn’t sell it to anybody, he felt an end to that failure. He felt freed from a burden and able move on to the next thing with the lessons he learned. So fail. Try things. Don’t be afraid to do it. Joel then shares a story about letting go of his stuff. Since his sabbatical, he decided not to own a home again. To meet his kids’ needs, he moved around a lot and took all this stuff everywhere he went. He had a massive software collection, collectibles, comic books, knickknacks, books, and so on. Before his most recent move, Joel decided to find an apartment that he really loved and do the mother of all purges. He got rid of about 85% of his personal possessions. Now, Joel feels liberated and is having more fun because he’s learned what not to do. That’s why he wrote The Fun Factor and why he hopes it will liberate a lot of people. Listen to the show to hear my thoughts on businesses that experienced failure before succeeding. With the YouTube Studio app, you can access features from the Creator Studio dashboard on your mobile device. This app is especially helpful for anyone who regularly updates a YouTube channel. When you first log in to YouTube Studio, you see an overview of your analytics, including watch time, views, and subscribers. You can also tap the hamburger menu to access features for managing your videos directly from the app. You can also interact with people who leave comments on your site. Beyond the basic analytics you see when you log in, the app also has a dedicated analytics component that allows you to see almost every kind of analytics you can imagine. YouTube Studio is free and available for iPhone and Android. Read The Fun Formula, and if you order a copy by June 15, enter your receipt number to access $100 worth of bonus content. Follow Joel on Facebook and Instagram. Learn about Joel’s donut tweet. Watch Candace Payne’s viral Chewbacca Mom video. Discover more about Travis Wright, Joel’s podcast co-host. Try the YouTube Studio app for iPhone or Android. What do you think? What are your thoughts on doing work you enjoy? Please share your comments below.